(CBS) Are studies tying red wine to health benefits nothing more than wishful thinking? Some red wine studies may soon be called into question following a report that a top researcher at the University of Connecticut falsified data on more than 100 occasions. UConn officials conducted an internal review into the work of Dr. Dipak K. Das, director of the cardiovascular research center at the university, after the university received an anonymous tip. 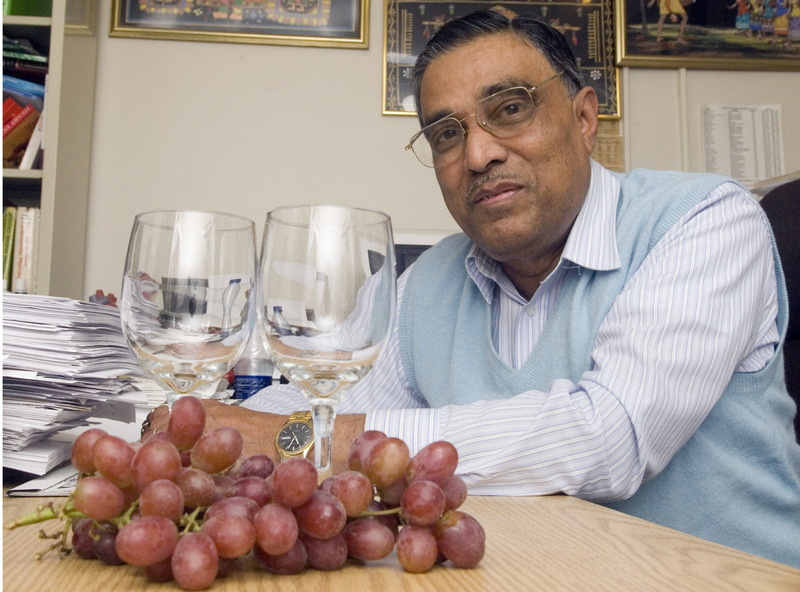 Das had been known in recent years for his research on the benefits of resveratrol, a compound found in red wine. Resveratrol is thought to work because it activates proteins called sirtuins that have been shown in studies to have protective benefits. The officials found 145 cases of fabricated or false data and notified 11 journals - including the Journal of Cellular & Molecular Medicine and Journal of Agriculture and Food Chemistry - of its review, the university said in a written statement. "We have a responsibility to correct the scientific record and inform peer researchers across the country," Philip Austin, interim vice president for health affairs, said in the statement. As a result of UConn's three-year investigation that culminated in a 60,000 page report on the allegations, UConn has declined $890,000 in research grants and cut off external funding to the lab. It's unclear at this time which studies contained falsified data, so wine aficionados can hold out hope that red wine might benefit a person's health. The Connecticut Mirror reports that much of the research discrepancies centered on "western blot" figures, which illustrate specific proteins from tissue samples. The review showed these images may have been manipulated to combine data from other experiments, which were passed off as coming from a single experiment. "Many figures had more manipulations but, for expediency, the review board only noted the most obvious," in flagging 145 cases of misconduct according, to the paper. According to the research bibliography site PubMed, Das has served as a lead author or co-author on more than 150 articles, including a Jan. 2012 study titled, "Health benefits of wine and alcohol from neuroprotection to heart health," published in Frontiers in Bioscience. Das' other areas of research besides resveratrol include medicines derived from plants and the molecular structure of plants and herbs and their effect on heart disease, according to the Associated Press. Earlier reservatrol studies have suggested the compound might be"exercise in a bottle"in its ability to stave off the effects of a sedentary lifestyle, while other research has said the compound might reduce risk for skin cancer. According to the Mayo Clinic, some studies have showed resveratrol lowers levels of "bad" cholesterol and protects the lining of heart blood vessels. In 2009, 60 Minutes' Morley Safer profiled potential benefits of resveratrol. Some resveratrol researchers were not concerned by the fraud allegations and still believe the compound can improve longevity. "I don't expect this news to have a big impact on what we work on," Dr. David Sinclair, a resveratrol researcher at the Harvard Medical School, told CBS News in an email. Sinclair had been featured in the 2009 60 Minutes report. Sinclair said his research focuses on sirtuins and aging, while a lot of the published research papers in question focused on heart health. "There is a comprehensive body of literature in mouse and rats indicating that resveratrol is effective in preventing numerous diseases in those animals, including type II diabetes, neurodegeneration, fatty liver, and inflammation, Sinclair said. "These results would not be in question, even if some of his work is retracted."